News from DRD on their new Belfast on the Move proposals, which will seek "to develop a sustainable transport system to serve the central area. This will be focused on improved public transport services, better facilities for walking and cycling and a reduction in the dominance of travel by private car." Transport Minister Conor Murphy today launched the consultation process for an ambitious Traffic Masterplan for Belfast city centre entitled ‘Belfast on the Move’. It aims to substantially reduce traffic levels in the city centre and provide more road space for public transport, pedestrians and cyclists. The Minister said: “Belfast city centre has been transformed in recent years with major regeneration and retail redevelopments. A thriving city centre needs a transport system that not only encourages the use of more sustainable transport to reduce congestion but also enhances the environment for those who shop, visit, work and live in Belfast city centre. 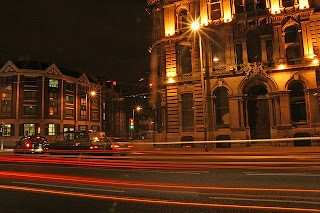 “Around 30,000 vehicles per day travel through the city centre on the streets either side of City Hall. About 60% of this is through traffic, with no final destination in the city centre causing needless congestion. This Traffic Masterplan for Belfast aims to substantially reduce those traffic levels and provide more road space for public transport, pedestrians and cyclists. “My vision is to achieve a city centre where access by public transport is given a much higher priority, and to create a safe street environment tailored to the needs of pedestrians rather than the private car. Over 40% of households in Belfast do not have access to a private car and therefore rely on public transport. For the city centre to thrive, people need to be able to access goods and services swiftly and efficiently and public transport will play an increasingly important role in this as non essential traffic is redirected away from the central area. The proposed ‘Sustainable Transport Enabling Measures’ will require the redistribution of available road space in the city centre in favour of public transport, pedestrians and cyclists. Improvements will be made to the road network to the west of the central area to provide an alternative route for northbound traffic. 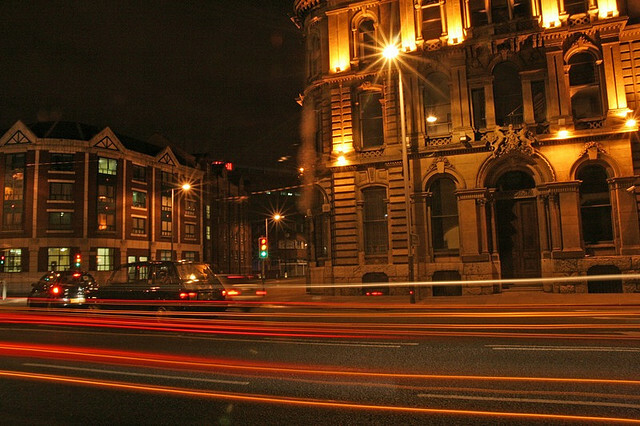 The longer term objectives of the Masterplan are to remove through traffic from the streets around City Hall so that it can be linked directly to Donegall Place and to improve public transport by facilitating cross-city bus routes and future Rapid Transit routes. · Northbound through traffic re-routed from Great Victoria Street onto Hope Street and Durham Street with south bound traffic continuing to use Great Victoria Street. Grosvenor Road will become one-way westbound and College Square North one-way eastbound. · The redistribution of existing road space will provide extensive bus priority measures for use by public transport, taxis and cyclists. · The delivery of 20 new controlled pedestrian crossing points; about 2.6km of new bus lanes which will also accommodate cyclists and taxis; 340m of new dedicated service bays; 1km of new dedicated cycle lanes and over 40 additional dedicated disabled parking bays. Lord Mayor, Councillor Pat Convery, welcomed the proposals and pointed out that Belfast City Council has recently published its own revised Transport Policy, providing a framework for it to lead by example and help shape transportation in the city in a sustainable, accessible and cost effective way for all those who live, visit and work in the city. The public are invited to view the proposals at exhibitions to be held in Castlecourt Shopping Centre (Monday 4 – Wednesday 6 October 2010) and Victoria Square Shopping Centre (Thursday 7 – Friday 8 October 2010) and DRD offices at Clarence Court, 10-18 Adelaide St (Monday 11 – Friday 29 October 2010). 1. The Traffic Masterplan has been developed by DRD in conjunction with the Department for Social Development, Belfast City Council, Translink and other key stakeholders. · A City Centre Ring creating an ‘urban boulevard’ to reduce its barrier effect between the core of the city centre and surrounding areas. · A Civic Spine running through the core linking locations of key civic importance with reduced levels of general traffic and increased priority for public transport (centred on Wellington Place, Donegal Square North and Chichester St.). · The Belfast Cross (based on the main central retail streets of Donegal Place/Royal Ave and High St/Castle St) with high levels of priority for pedestrians. · High Accessibility Zones around public transport nodes in the city centre. · Make it easier and safer to walk, particularly crossing streets. · Reduce the level of traffic travelling through the central area. · Reduce bus journey times and improve reliability. · Reduce bus layover and dwell time. · Facilitate future rapid transit proposals. · Provide additional cycling facilities. · Retain good levels of accessibilty for disabled users. · Ensure reasonable provision for on street parking and servicing of shops and businesses. · Provide further opportunities for public realm improvements and expansion of the pedestrian areas. 4. The Masterplan is closely linked to DSD’s ‘Streets Ahead’ public realm project and future proposals for a Rapid Transit system that will route through the city centre. Please Please Please make it stop. Everywhere else people are trying to take this sort of thing out!!! Has somebody got a good deal on road paint or something?